Telluride Town Park - imagination station Telluride public pool. Telluride Town Park is located towards the eastern end of town and it occupies a vast area of flat open space frequently visited by locals and Telluride visitors. The park is also utilized by the town and event organizers to host some of the most popular festivals including the annual Telluride Balloon Festival, Blue Grass Festival, Blues & Brews Festival and many more. The park is home to two playgrounds. The smaller one is located towards the western end of the park and offers toddlers and small kids the opportunity to enjoy endless fun in a playground which was designed specifically to accommodate for the little ones. The second playground is called Imagination Station and it was custom built to blend in with the surrounding environment and has been a destination for local and visitors alike. 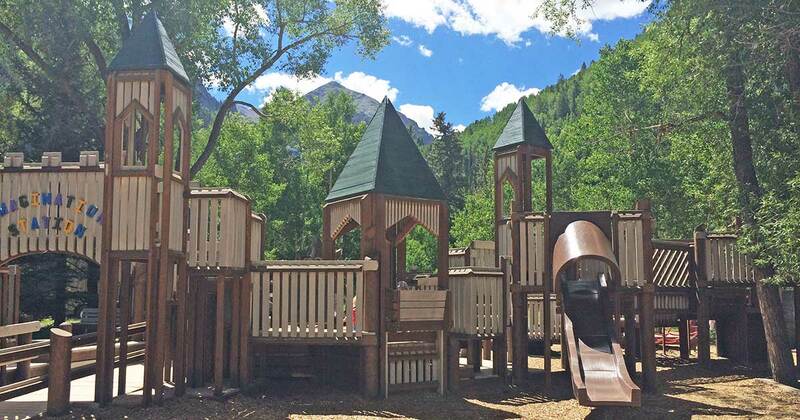 Imagination Station is truly a unique playground and one of the most sought Telluride destination for kids of all ages.